From his office, David Koch looks out on a galaxy of stars. The view stretches over one arm of the Milky Way and spans the center of the constellation Cygnus. But instead of a vast picture window on space, the astrophysicist stands before a solid wall--the surface papered with hundreds of hand-sized images, arranged edge to edge. Each one reproduces a small square of the night sky, packed full of stars. In this rich star field, Koch and his colleagues plan to hunt for planets. They will bank their hopes on a mission named after 17th Century astronomer, Johannes Kepler, who described the motions of the planets. The mission, and the "Kepler" instrument they hope will carry it off, are still far away from that final launch into space. They now exist only on paper and in test stages in the basement labs of the NASA Ames Research Center in Mountain View, California. The Kepler team enters the race at a thrilling time in the field of planet hunting. Planets outside our solar system, whose very existence was questioned less than a decade ago, now seem to pepper the cosmos. After years of patient diligence by these teams, the number of known planets has soared. The Kepler mission differs significantly from its predecessors. All of these have found gas giants like Jupiter. Keplers quarry is much closer to home, so to speak. "Our goal is to find habitable planets--Earth-sized planets circling sunlike stars," said Koch. The Kepler mission will look for worlds similar to ours in size and distance from their suns. Earths conditions still serve as the best first guess of those providing the potential to evolve life, since so far we only have this one example of lifes success. Kepler will search deep into the galaxy, scanning not just hundreds of stars, but 100,000 all at once. The search for these planets will tell us whether Earth is alone in its ideal position in relation to its sun or whether there are many other small "Earths" around us. Then astronomers can expand the depth of their probings. Using other tools to try to detect the planets compositions and the presence of an enveloping atmosphere, they will keep a keen eye out for any that might support life. As the data matured and search techniques improved over the last six years, planet search efforts began bearing fruit. Astronomers found the very first, strange planets circling the dense, burned-out core of a dead star, or pulsar. This discovery proved there were other worlds out there, but pulsars are definitely not like our sun, and the chilled planets around them have little resemblance to our life-friendly Earth. Astronomers Michel Mayor and Didier Queloz at the University of Geneva in Switzerland were the next to catch the brass ring in 1995, but this time the star was like our sun. 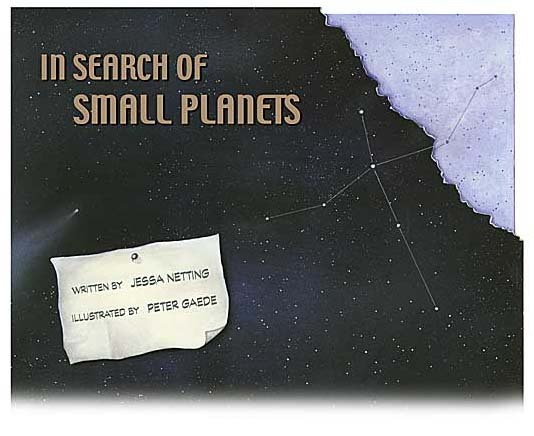 Their search wasnt geared towards finding anything as small as a planet around the small, yellow star called 51 Pegasi, a rather ordinary point of light in the constellation Pegasus. They were looking instead for elusive brown dwarfs, unignited suns that astronomers had theorized about but had not yet detected. Brown dwarfs fit neatly in the size category between giant planets and small stars. Instead of a dwarf, Mayor and Queloz found a planet. The discovery was not only unexpected, it was decidedly weird. The new planet was about half the mass of Jupiter. But instead of circling slowly in the cool, middle distances of its solar system, it orbited its star frantically. This great planet blazed a tight circuit around its sun, completing its year only four Earth days. The planet that Mayor and Queloz found seemed at first like an cosmic freak, but it turns out there are a fair number of strange planet-sun relationships out there. Among the initial doubters of the Mayor and Queloz planet were Geoff Marcy and Paul Butler, then at the University of California, Berkeley. These veterans of the planet search had themselves searched in vain up until this point. They realized their data might be hiding similarly large planets with short orbital periods. Collaborator Steven Vogt, of the University of California, Santa Cruz recalls thinking, "Boy, were they going to see a lot of planets falling out of the sky." And this was exactly what happened. 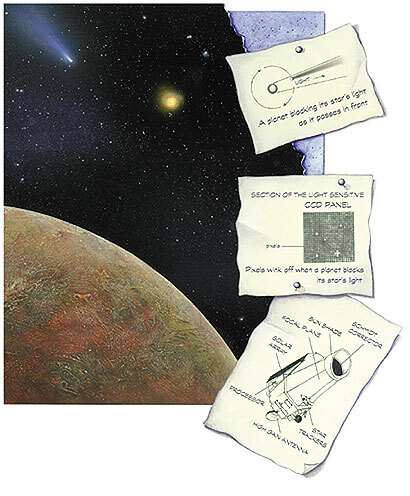 Marcy and Butler began to find similar planets using a particularly sensitive method called Doppler spectrometry. It detects the wobble of starlight as a planet exerts gentle gravitational tugs on its sun, pulling it off kilter like a dog pulling its owner on a leash. This tug back and forth on the star as the planet circles it shifts the spectrum of light that reaches us. It distorts the light along the spectrum from the red to the blue end and back again, just as the sound of a siren shifts from a low moan to a piercing whine as it races by. Vogt helped fine-tune the spectrometers, these "instruments of exquisite precision," as he calls them, which spread out starlight into a band of colors and pinpointed the shifts. With Vogts adjustments, Marcy and Butler became the most successful team yet, discovering the majority of planets now known. These newly discovered planets are momentous finds. But without exception, the planets appear to be gas giants, behemoth planets like Jupiter or larger, whose crushing gravity wont permit even the lightest gases to escape their grasp. These planets are probably swaddled in layer upon layer of dense, noxious atmosphere which envelop diminuitive cores of ice and rock, or even hydrogen compressed to a liquid metal. Some of them circle their suns in exceedingly tight orbits, cheek by jowl with heat sources that roast them deep into their interiors. Others inch in close to their suns on approach, only to swing wildly away into frigid space at the edges of their stretched-out, elliptical orbits. These gas giants are surprising, fascinating worlds that baffle the predictions of astronomy theorists. But in spite of all the questions these new planets raise, one aspect of their existence is fairly certain. Of all of the newly detected worlds, none is likely to support life as we know it. Kepler mission members are most interested in searching for planets within a relatively temperate band of space around the parent star, called the "habitable zone." This is the swath of space around a star that is just at the right point for the existence of liquid water, neither too far away and cold, nor too close and hot. Habitable zones vary in size and temperature depending on the size and heat of the central star, but their limits are strictly delineated. Stray too far away from the sun, and a planets water can be frozen solid, slowing or ceasing the numerous chemical reactions that make life possible. Move in too close to the solar inferno and a planets atmosphere boils off into space. The Kepler team intends to increase the odds of finding life-friendly worlds by searching specifically for "Earths," planets like our own. This was the Holy Grail inspiring the quest of project initiator and the other principal investigator, Bill Borucki. Planet hunters have found gas giants to date because their methods happen to be suited to detecting large planets orbiting close to their stars. A star hosting one of these massive neighbors is tugged just enough for its wobble to be detected. Detecting mammoth planets that hug their suns is no small feat. But attempting to find modest, Earth-sized planets, dwarfed by and distant from the suns they orbit, is a far more daunting proposition. To do it, the Kepler team had to come up with a new kind of planet detector with the precision to detect minute light changes, the sensitivity to monitor a distant patch of sky in the galaxy, and the ability to keep track of hundreds of stars at once. Borucki nursed the idea of a search for Earth-sized planets for years, and then in the early 90s the technology cheap enough to make it feasible finally hit the scene. Borucki provided the scientific inspiration for the mission and Koch came up with the engineering to make it fly. "I wouldnt have," recalled Koch, "if [Borucki] hadnt come in the door and said, Hey, do you think we can do this?"
Borucki knew that he needed something that didnt rely on the subtle wobble of a star. Instead he needed an instrument that would detect a stars dimming as a planet slid across its face, something like an eclipse by a tiny moon. These "transits" cause the starlight to dim ever so slightly each time the planet orbits its sun in front of the line of sight. He needed an instrument that would pick up these minute changes in light levels using a photometer, essentially a giant light meter like the one that measures light levels in a camera. Although they cannot resolve images as can cameras or telescopes, photometers can measure changes in the intensity of pinpricks of light that telescopes could never detect. A single one of these pinpricks traversed by its planet might dim as little as a distant street lamp would, when walked across by a fly. The photometer could point to an entire region of space and monitor the light every point of starlight that fell across its field of view at once. This kind of vision was unique for the time, remembers Koch. There were many skeptics along the way who doubted a photometer could detect such dimming. "It was very troublesome at first," said Borucki. "The scientific community said in a journal that this approach wouldnt work, that they should not be funded."
Boruckis initial plan used what are called "photosensitive diodes" to monitor this light. The photodiode in its simplest form is a tiny patch of silicon. When light falls on it, from a star for example, it puts out an electrical charge. If a planet passes in front of the star, the change in light intensity shows up as a change in voltage. Around this time Koch met with Harold Reitsema, an aerospace designer at Ball Aerospace in Boulder, Colorado. They were discussing the feasibility of another NASA proposal, but Boruckis plan for Kepler came up in the conversation. Clearly diodes werent the way to go. The problem, explained Reitsema, is that each one must correspond to a single star. A diode needs to sit precisely where a single stars light will fall on it. The arrangement of diodes mirrors the positions of a sky full of stars. If any of the materials of the instrument deform slightly with a temperature change, or the alignment is off so that the stars light is slightly deflected, the diode for that star is useless. Instead, the two men started discussing the possibilities of charge-coupled devices, or CCDs. A CCD is like computer screen with thousands of individual units or pixels, but rather than producing light, it records wherever the light hits it. "Imagine taking 2000 X 2000 diodes and jamming them all together," explained Reitsema. "Then you dont care where [the star] is because you have the whole surface covered." Whereas fewer than a couple hundred photo diodes would fit on a instrument like Kepler, the mission could essentially carry 81 million individual sensitive devices at once if it used CCDs. That increased the number of stars that the satellite could monitor by many hundreds of times. In the early 90s when they first began the mission design, manufacturers had just begun to turn out commercial-grade CCDs in large quantities for the new market of camcorders and other consumer goods that used them. This pulled the production costs of high quality CCDs down as well. This doesnt mean that Kepler comes cheap, however. Budget estimates hover somewhere around $22 million. But per star monitored, the cost for this mission drops precipitously. "The argument is that its nice to find a planet but nicer to find many planets," said Reitsema. "The return on this one is thousands and thousands of planets." In the late 80s, too little was known about the natural variation in the light levels from stars to determine whether the small drop in light caused by a planet transit could register at all. But in the early part of the next decade, data came in from the only star that had been extensively studied in this way--our own sun. Stars vary in brightness and some of them even pulse regularly, but the solar data indicated that the variations were not on the order of hours--the time it would take for an Earth-sized planet to pass in front of a star. If the sun is at all representative of the stars Kepler will be monitoring, the variation of planetary transits can be distinguished from the noise. Still, doubters of the mission were uncertain about whether transit photometry would work. For the last year Koch has been putting Keplers CCDs through tests of their detection capabilities. He found that the CCDs could detect the dimming of a simulated star when transited by a tiny simulated planet. To recreate in miniature such a planetary passage, they sent an electric current through a fine wire which was stretched in front of the pinpoint of light. As the current moved through the metal, the wire expanded by a an almost imperceptible amount. The expanded wire blocked the light just a little more than it had before--not much, but enough to simulate a planetary dimming The CCDs picked this up and passed his tests. What changed the minds of the projects most intractable skeptics, however, was the November transit of a planet in front of its star, an event predicted by Marcy and Butler. Astronomer Gregory Henry in Tennessee detected the dimming of a star with an Earth bound telescope. It happened at precisely the time that Marcy and Butler said the planet would pass in front of its star. Now that dimming from a transit had been shown, the field was ripe for a larger-scale detection effort. Kepler is a mission made up of a single instrument. The instrument is a simple design, looking like a chunky monocular for spotting birds or a rather short spyglass the size of a compact car. Wrapped in gold foil, its one glassy eye always focuses on a single patch of sky. Inside the housing, 21 CCDs, each about the size of a Kit Kat candy bar catch the starlight. A single CCD plate has 2048 x 2048 pixels. An array of solar panels curves halfway around the body to power the instrument and only a few small devices protrude from the housing: a pancake-shaped antenna at the large end, and instruments to keep Kepler on course and to track the stars. To take advantage of the CCD plates capacity for detecting individual points of light, and thus increase the chance of detecting a planet, Kepler will look at a distant part of the galaxy that is chock full of stars, the Cygnus arm of our galaxy. Instead of monitoring 100 to 200 stars at a time, as other planet detection systems do, Kepler will monitor 100,000 stars at once. The system would never have to break this steady gaze and risk missing a transit for a full four years. The mission team estimates that only one of 200 Earthlike planets would circle their stars at such an angle that they might pass in front of Keplers "line of sight" and dim the star. This makes the chance of recording a transit only half of a percentage. But with so many stars monitored, that half of a percent could mean that as many as 500 planets are sighted--instead of just one or two. Upon detecting a change in light, Kepler can determine how much the star dimmed and for how long. A dark sunspot rotating across the face of the sun would also dim it, but the chances go up that it is a planet that has been sighted after the second incident. This tentative second detection also provides an estimate of the "period" or time required for each complete orbit, if it is a planet. Once you see the same thing a third time, Koch said, you can be pretty certain there is a planet. The change in light level, the time for one transit, and the period of each transit tell scientists whether theyve found a jumbo or junior class planet and how closely it circles its sun. From this, they can calculate its average temperature. That is all they need to know to get a good idea of whether the planet is in the right size range and orbit to support life. In spite of Keplers narrow task, it seems to fill a niche that other missions, like the Hubble Space Telescope, do not. Koch describes the difference in the field of view: hold a grain of sand at arms length in front of the night sky. The width of the sand grain covers the field of view of Hubble. This big telescope is really best for peering intensely at one very small dot of sky at a time. Kepler, in contrast, looks at the equivalent of the amount of sky that two open hands held at arms length would cover, he says, "In other words, about two dips from the Big Dipper." Only about 30 stars lie close enough for Hubble to monitor carefully enough to record a transit. Hubble would have to be dedicated to this sole task for 24 hours a day over a period of years to avoid missing a planets transit of just a few hours, a waste of the telescopes time and considerable power. Another method, interferometry, challenges Keplers possible monopoly on Earth-sized planet detection. While spectrometry looks for the spectral changes caused by a wobble of the parent star due to a tugging planet, interferometry actually measures the movement of the star. The planned Space Interferometry Mission (SIM) could detect a planet roughly six times the mass of Earth at about the same orbital distance from its sun as the Earth is, while photometry detects planets equal to Earths mass. The Keck Telescopes in Hawaii will also be able to detect planets , but only those 66 times the size of Earth. Although only a few dozen stars of the appropriate type lie within SIMs limited range, the Kepler team aims to monitor 100,000 stars. From them they expect to detect 600 planets, ranging in size from Earthly twins to those twice Earths size. Seventy percent of these will be systems with more than one planet. Whatever the result, Borucki says that his team will come up with a definitive answer to their most pressing question: Does Earth alone hold such a favored position in the kingdom of its star, or do myriad earthly worlds, all endowed with benevolent climates, dance around their nurturing suns? At the very least, says Borucki, "We will learn enough for our species to rethink its place in the cosmos." Editor's note: NASA has selected the Kepler mission proposal as one of three finalists for the next round of Discovery missions. Internships: Popular Science Magazine, New York; Scientific American Magazine, New York; National Public Radio Science Friday, New York; Monterey County Herald, Monterey, California; Nature, Washington D.C.